This image shows the region surrounding nebula Messier 78. The orange areas are where new stars are being formed. If you're looking at the photo above, you're looking at dust. Cosmic dust to be specific, and dense gas clouds: the stuff that astronomers study as the places where new stars form. This image is centered on the reflection nebula Messier 78, also known as NGC 2068. It's called a reflection nebula because in the visible light spectrum, the clouds of dust and gas reflect the pale blue starlight seen under shocking orange in the image. That orange, by the way, represents the sub-millimeter wavelength radiation from dust grains that the Atacama Pathfinder Experiment (APEX) observed under the direction of Thomas Stanke (European Southern Observatory), Tom Megeath (University of Toledo) and Amy Stutz (Max Planck Institute for Astronomy, Germany). In visible light, these orange areas would look like dark tendrils reaching across the nebula. APEX is capable of observing cold clouds of gas, some as cold as -250 degrees Celsius, which allows astronomers to see inside these dark dusty regions, in order to study star formation. These orange areas indicate dense clouds of gas and dust where stars are actively being formed, evidenced by high-velocity streams of gas flowing out of the dense areas. Those gas streams are being ejected by the young stars as they take form within the cloud. Let's not forget the top of the image. That's actually a reflection nebula separate from Messier 78, known as NGC 2071. NGC 2071 contains a star with an estimated mass five times that of our own Sun. 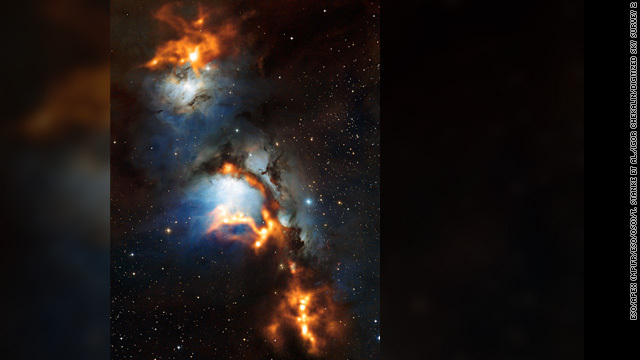 Take a look at the image of Messier 78 and NGC 2071 in full size, and the instrument that helped produce it.